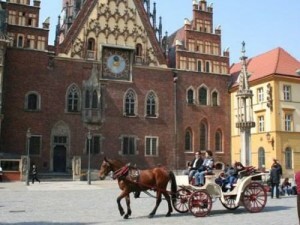 If you do not feel like walking you should try the horse carriage tour round the most beautiful places in Wroclaw. 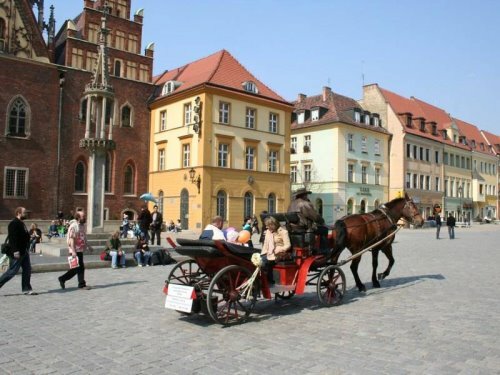 An old fashioned horse carriage along with the atmosphere of Old Town will bring you unforgettable moments. This tour will give you an overall impression of the city of Wroclaw, including its oldest part – Ostrów Tumski (Cathedral Island) with the gothic Cathedral of St. John the Baptist, the main building of the Wroclaw University with its splendid representative hall ? baroque Aula Leopoldina, as well as a walk through the streets of the Old Town culminating in the magnificent Market Square – the pride of the city. Here you have a trip arund the Market Square and the old town in an old fashioned horse carriage. The highlight of the tour is a guided half-hour visit in the Museum of Panorama Raclawicka, gigantic painting depicting the historical victory of Polish peasants over the Russian forces. Venue: the city of Wroclaw: Ostrów Tumski (Cathedral Island), the main building of the Wroclaw University (Aula Leopoldina), Market Square, the Museum of Panorama Raclawicka. Notice: On request there is a possibility to choose some other places and make the trip longer.